Filling up the last bit of available space in the datafiles. Causing the Temp tablespace to madly expand until it reaches its maximum size. Stealing all of the memory on the server, so much for setting the PGA_AGGREGATE_TARGET parameter. Yes, the script is performing bulk collection (2 DBAs stand up and clap, the rest start shaking their heads side to side). OK, the PGA_AGGREGATE_TARGET is just less then 1.8GB, and the server has 12GB of memory. Now for the test, we will need two sessions, session 1 will be the session that executes the above script, and session 2 will execute various queries to see what is happening in the database. From the above, Oracle is planning to perform a NULL aware hash join between table T1 and T3 (predicted to consume 410MB of space in the TEMP tablespace… is this the true unit of measurement, keep reading), and then join that row source to table T2 using a NULL aware hash join (Oracle 10.2.0.4 and lower will not use a NULL aware hash join – you have been warned) – the SQL statement involving tables T1, T2, and T3 is the SQL statement that will be executed in the PGAMemoryFill.sql script. The 368640 KB value reported for the _PGA_MAX_SIZE in the V$SQL_OPTIMIZER_ENV view exactly matches the value for _PGA_MAX_SIZE returned by the query of X$KSPPI and X$KSPPSV. 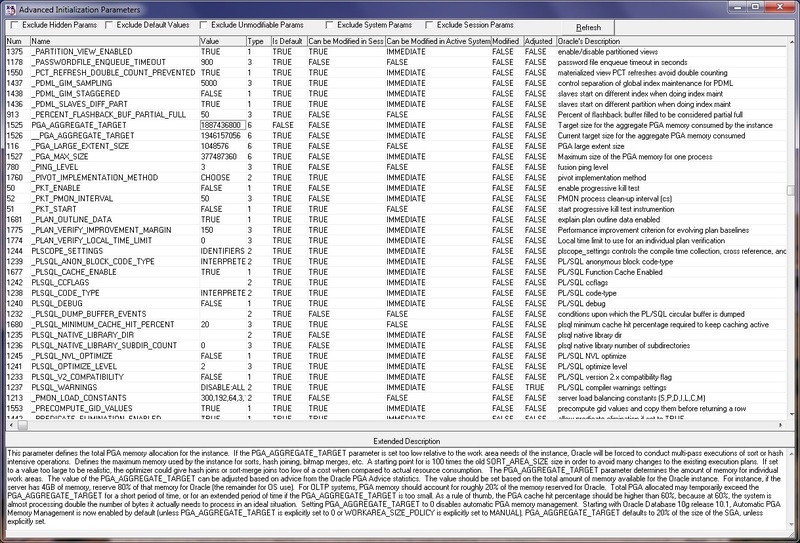 ACTUAL_MEM_USED: Amount of PGA memory (in bytes) currently allocated on behalf of this work area. This value should range between 0 and WORK_AREA_SIZE. TEMPSEG_SIZE: Size (in bytes) of the temporary segment used on behalf of this work area. This column is NULL if this work area has not (yet) spilled to disk. While session 1 is busy executing the PGAMemoryFill.sql script, session 2 will periodically query the V$SQL_WORKAREA_ACTIVE view to see what is happening. Now there are two hash joins active for the SQL statement with a total of 51.26MB of PGA memory in use. One of the hash joins is still an optimal execution, while the second has become a 1 pass execution. Now both of the hash joins are reporting a 1 pass execution. A V2 sort operation has joined the output, and it too is executing as a 1 pass operation. The session is now using just over 274MB of PGA memory based on the output of this view. 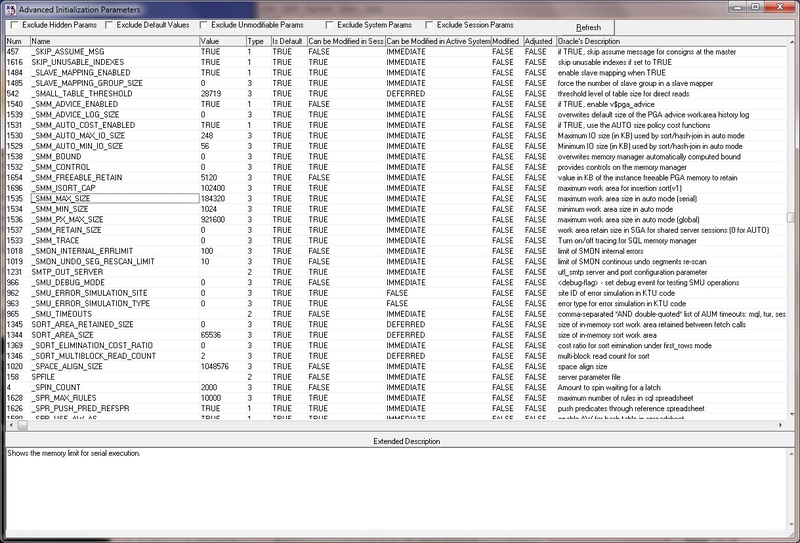 The session has made it up to 310.77MB of PGA memory, and the TEMPSEG_SIZE column values continue to grow. One of the hash join operations has completed, must be about done now. Based on the above, Session 1 is not consuming about 90MB of PGA memory, but instead roughly 3234.39MB of PGA memory (the 2 DBAs still standing and clapping should sit down now). Let’s hope that the DBA responsible for this database did not consider the 1800MB value for the PGA_AGGREGATE_TARGET parameter as a hard upper limit, and set the other parameters to take full advantage of the 12GB of memory in the server. The session is still consuming 9.57MB of PGA memory just sitting idle – remember this number. OK, it does not need to be that SQL statement, but until another SQL statement is executed, the 352MB acquired by each of the three sessions cannot be used for anything else. And that, my friends, is the developer’s secret weapon for stealing all of the memory in the server. Now try to modify the SQL statement in the PGAMemoryFill.sql script so that all three workarea executions are optimal executions to see how high the memory usage can be pushed while executing the SQL statement. >And that, my friends, is the developer’s secret weapon for stealing all of the memory in the server. The DBA’s secret weapon to stop yet another crazy developer is event 10261. Not a panacea, of course, but the only way to hard limit PGA usage per process. “ORA-10261: Limit the size of the PGA heap Cause: the limit is one kilobyte times the level of the event. If the pga grows bigger than this signal an internal error. But then the question becomes, what is the appropriate value (in your database, not necessarily the test database that I used) for event 10261 so that the necessary queries themselves do not fail, but silly settings for the bulk collect limit are not permitted to consume a significant amount of memory? Then you have to deal with problems like the second of the above problems that involved 4 sessions, in which 3 of the sessions returned an ORA-01652 (cannot extend the TEMP tablespace) during the sort operation without returning the roughly 352MB of PGA memory consumed by each of the sessions. While the session for setting event 10261 is a good one, there probably is not a right/correct answer for the level of the event. Note that there is a follow-up blog article that is scheduled to appear 24 hours after this blog article appeared. >While the session for setting event 10261 is a good one, there probably is not a right/correct answer for the level of the event. Having PAT=1800m, don’t you think it’s quite reasonable to limit single process PGA by 756MB? 😉 It won’t help in all cases, but will provide some protection against running ~PGAMemoryFill.sql – that is the main purpose of the event 10261, I think. In which case can the “total PGA allocated” be greater than “aggregate PGA target parameter”? The parameter pga_aggregate_target is set to 1628M and this is what is shown in “aggregate PGA target parameter” but the “total PGA allocated” is showing 4250M.The database is 2-Node RAC and 10.2.0.4 version on sun solaris. Oracle will try to not exceed the PGA_AGGREGATE_TARGET. To help processing efficiency, when little of the PGA memory is in use, a single session may use up to the amount of memory specified by the _SMM_MAX_SIZE hidden parameter per workarea before needing to use the temp tablespace for a one-pass or multi-pass workarea execution. As demonstrated above, more than one workarea could be in use at one time. In Oracle 10.1.0.x and below, this _SMM_MAX_SIZE limit was set to 5% of the value for PGA_AGGREGATE_TARGET. If you look at the two screen captures in this article, you will see that the 5% limit has increased in recent releases. Assume that a couple of sessions are executing, and each is using two workareas simultaneously for an optimal in-memory execution, and then 10 more sessions start processing. As the PGA_AGGREGATE_TARGET value is approached, the 10 new sessions might be forced to perform multi-pass operations when performing the same task that the other sessions are performing completely in memory – this is an effort by Oracle to try to adhere to the PGA_AGGREGATE_TARGET value, but the sessions will still need some PGA memory. Now, assume that another session starts that performs a bulk collect, or another PL/SQL feature that must requires a lot of physical memory – Oracle has a choice at this point, but failure is not one of the choices, so it exceeds the PGA_AGGREGATE_TARGET value to permit the session to continue executing. Is there some limit to which the PGA can exceed?Does it depend on the space avaliable in RAM? I believe that an error will be returned to the client once all of the physical memory in the server is consumed – this likely assumes that the operating system will not be able free additional memory fast enough by swapping out infrequently used memory contents to the page file. At least that was the result of an experiment that I performed eight months ago on the 64 bit version of Oracle 11.1.0.7 running on Windows. If you would like to test to determine what happens on your server (hopefully a test server), modify the PGAMemoryFill.sql script that is shown above – remove the “ORDER BY T1.C2 DESC, T1.C1 DESC” portion of the SQL statement, then execute the script using several sessions. Thanks for the input.Its not a test server so can’t try.One more question is popping up in my mind…Does this “total allocated PGA” size decrease if not used means when the processing sessions end ? ?or does it remain the same,it doesn’t decrease?? Based on my testing, if the SQL statement executed by the session completed successfully, the memory should be returned to the operating system after the SQL statement finishes (when the PGA_AGGREGATE_TARGET is used). When the SQL statement failed to finish executing (when the temp tablespace reached its maximum size), the memory was not released to the operating system until the session executed another SQL statement or disconnected. The behavior might be different on other platforms and other Oracle versions.